Since 1939, Northfork Electric has provided reliable and competitively priced electricity to our members. Your cooperative is your trusted source for energy so that you can truly weigh the cost and benefits of all forms of alternative energy. NFEC recognizes that some members have an interest in solar energy. However, many times the information received may be confusing or incomplete. We want to ensure that our members know what to expect when considering a solar generating system for their residence. Remember: Before you install a renewable energy source for your property, we strongly recommend you do everything you can to improve your current energy-efficiency. A few simple measures such as adding insulation and weather stripping can reduce your overall energy consumption. You may be able to save thousands of dollars in upfront costs by reducing the size of the system to meet your energy needs. Understanding your energy usage will also help prepare you for making informed decisions about your alternative energy purchases. 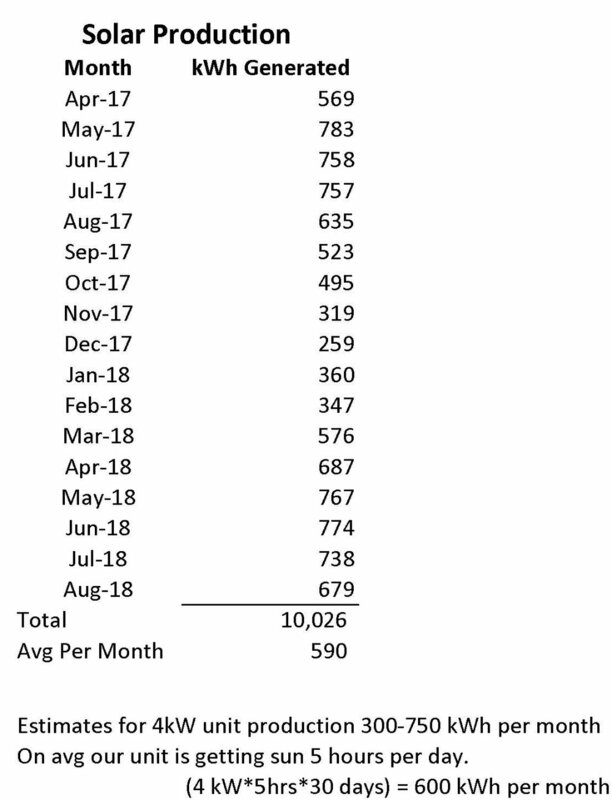 When NFEC installed the 4-kW solar unit at the headquarters building in March of 2017 my main question was how many kWh’s per month would the unit generate? NFEC’s office services team often speaks with members who are thinking about installing solar energy and this information could possibly help them answer questions that arise. Some consumers are under the assumption that if they installed a solar unit at their home that their bill would be drastically reduced or in some instances go away. Since April of 2017, we have been tracking the productivity of the solar unit at our headquarters building and the results are very interesting. These results are provided in the chart (list location of chart). As you can see, the unit produces an average of 590 kWh per month. This means that NFEC’s unit is getting an average of about 5 hours of good sunlight per day with higher numbers in the spring and summer months and lower numbers in the winter. It is important to remember that the unit’s productivity is greatly affected by things such as time of year, cloud cover or even dirty panels. Since the average NFEC residential member uses approximately 1600 kWh per month this would equate to about 37 percent of the typical residential members usage. With that being said, it is interesting that a typical residential home will have higher monthly kWh usage during one of the lowest solar generation production months (December = 259 kWh). This could be magnified on a member’s bill if a member’s home has electric resistance heat. This could make it seem to the member that their solar unit is not generating at all. On the flip side, one of the highest solar generation months (May = 762 kWh) is in a shoulder month. This is typically when homes have a low to moderate kWh usage. This can also be magnified on a member’s bill leading them to questions about why the unit doesn’t generate like that year-round. Will installing solar panels pay off for you? Although reducing your electric bill by approximately 1/3 is an attractive idea, there are other ways to possibly do this in a more cost-effective manner. Focusing on making your home more energy efficient should be one of the first steps. Consider replacing old heating and cooling systems, sealing air leaks and making sure to have the correct amount of insulation. Then, evaluate solar options. It is also important to note that just because a consumer reduces their electric dependence from the power provider by 1/3 it doesn’t equally translate into their bill being 1/3 less each month. This is because of the fixed charges associated with your billing that covers the costs to maintain the reliability and availability of the distribution system. If you are considering installing solar, be sure to contact us before you contract an installation so we can collaborate on the front end to ensure that you don’t experience any surprises. Solar energy has come a long way since 1830, when British astronomer John Herschel famously used a solar thermal collector box (a device that absorbs sunlight to collect heat) to cook food during an expedition to Africa. Today, solar energy systems work when sunlight hits a solar photovoltaic module (solar panel or PV panel) and causes electric current to flow. The current produced from the PV panels is controlled and regulated by an inverter, which converts direct current (DC) to alternating current (AC), needed for use by household appliances. A system that will generate 100 percent of your energy needs is extremely large and expensive, so most systems are sized to generate only a portion of your home’s needs. Thanks to their solar PV system, Mike and Kathy have seen from 12-40 percent savings on their electric bill. The couple has a stationary unit, but they are considering building a stand that will tilt with the sun to get them a bigger return on their investment. “It won’t have the ability to move and follow the sun simulating an actual sun tracker, but being able to tilt with the morning and evening sun will help increase savings,” Mike said. As prices decline and technology improves, installing a residential solar system can make sense for some consumers. State and federal rebates for installation can also help make a PV system more financially feasible, but adding insulation, sealing air leaks and completing other basic fix-it projects should be your first step in the solar process. “You can cut your energy costs immediately, and you’ll also be able to reduce the size of PV system you purchase,” Mike said. Your electric cooperative should be one of your first contacts. Experts at your co-op can answer basic questions, provide resource materials, direct you to reputable websites and might also maintain a list of reputable contractors and other experts in your region. Also, if you purchase a PV system, you’ll need to meet the requirements of your electric cooperative’s interconnection agreement and notify them in advance about your installation. If you are interested in solar or any other renewable energy options, please contact the cooperative at 580-928-3366. Because each home and situation is unique, please call us at 580-928-3366 so we can help.